Fall is almost here, which means it’s time to put away your summer clothes and get out your fall wardrobe. But what if your fall wardrobe is a little out-of-date? There are a few fall fashion essentials you can add to what you already have to keep you on trend this season! Scarves are going to be big this fall. Throw a scarf on any outfit for an instant, trendy boost! The fringed circle scarf above is a gorgeous mauve color for fall, but pretty much any infinity scarf will keep you on trend because they’re going to be huge this season. 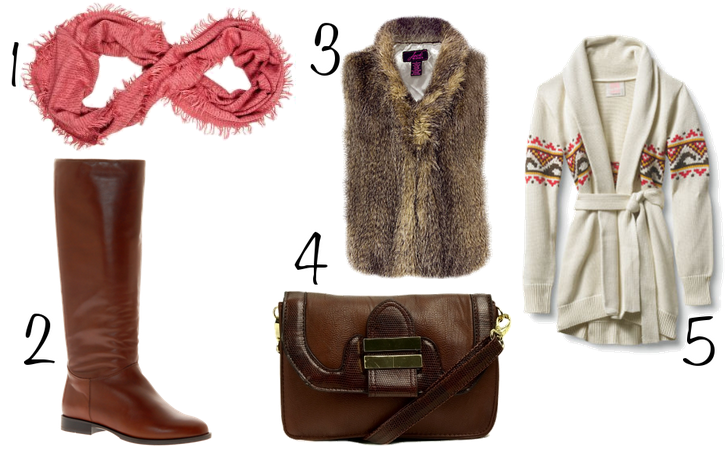 A pair of riding boots can be dressed up or down to go from cozy casual to dressy chic. Riding boots can cost anywhere from thousands of dollars for a pair of nice, leather ones, to under $30 for vinyl boots. Mine are from Old Navy, they look great, and they cost around $25. With that price, you could even consider two pairs of riding boots: One black and one brown, so you can match any outfit! Fur was all over the runway at Fashion Week, so we know it will be a trend this fall. You can throw a fur vest over any plain tee or long-sleeved tee for a versatile, cozy, and warm way to accessorize an outfit. If you’re a critter lover, it’s not hard to find a nice faux-fur vest…plus, faux fur won’t cost you as much! You’ll need a new purse for fall! The satchel handbag above is adorable and it can be worn as a shoulder bag or a cross-body bag. Across-body bags are big for fall… which is a great thing because they’re the best for freeing up your hands for a day out shopping. For those chilly fall days, you’ll need a big, cozy cardigan. The one above reminds me of the tribal print trend, and it would look really great dressed up with a tan belt cinched around the middle. What trends are you looking forward to wearing this fall? What trends do you wish would stay away?! Sarah Beckman is an editor at Affordable Style. One of her current projects is an article on ways to wear scarves!